Good quality Australian movies featuring an impressive Australian cast are few and far between. Thus when I was given the opportunity to watch such a film, I seized it without hesitation. 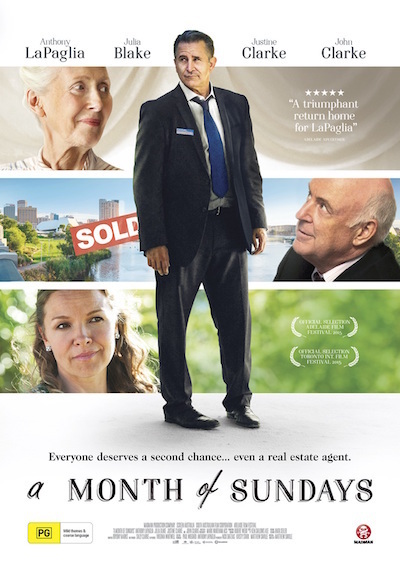 The movie is titled "A Month of Sundays". 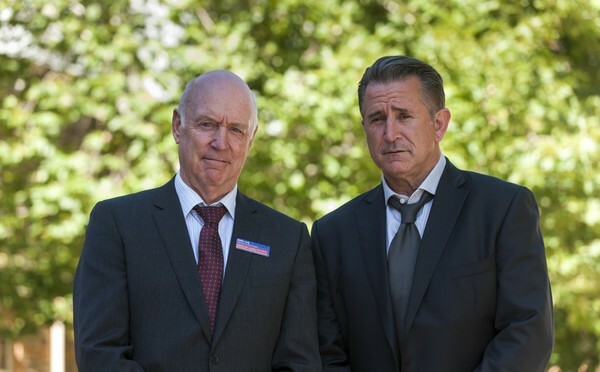 It centres on Frank Mollard (Anthony LaPaglia), a real estate agent who seems to have lost his enthusiasm for life. Despite the economic real estate boom, Frank fails to attract the big dollars. Depression and brooding is his forte and being miserable by being alone is natural. He is divorced from Wendy (Justine Clarke), an accomplished and well-loved actress with over 200,000 Twitter followers. They brought into this world a gifted son, who rebukes any attempt of conversation that Franks starts. Although Frank and Wendy are no longer married, he still acts and thinks that they are still together and in doing so, he's finding it extremely hard to move on. One night, he receives an unexpected call from his Mother (played by Julia Blake). Usually there is nothing extraordinary about receiving a phone call from a family member, except when that family member has died a year ago. In spite of being taken aback by the call, Frank still continues and carries on with the conversation, until he realises that the poor lady, Sarah, has dialled the wrong number. Undeterred by the fact that Sarah is not his 'Mother", Frank tracks her number and finds himself in front of this beautiful lady with an upside down "Welcome" mat on her front door. The visit is well received and Frank is invited to come back for lunch with Sarah's son, whose icy demeanour can freeze anything. What follows is a consequences of events that will make you think that there's more to life and everyone deserves a second chance. A Month of Sundays is presented in a comedic way. The witty comebacks are definitely entertaining. The film questions how we should measure our success - is it the big house, a luxury car or an enviable career? Having all the trappings of success, at what price do we pay; perhaps a broken family, our health, being lonely and alone. This movie is not about the cutthroat real estate business. For me it was about second chances and redemption. There are a lot of individuals out there who have difficulty letting go, therefore stunting their chances to move on. A Month of Sunday will resonate with most of us, as there is a "Frank" lurking beneath us all. At one point of our lives, we have all done something that we've regretted but are either too pompous or too egoistical to admit that it was wrong. But if we look from inside out, stop and smell the roses, perhaps the light bulb will switch on, where the "Welcome" mat will indeed bring meaning. This stellar cast film is unarguably impressive. Anthony La Paglia is Frank Mollard. This enigmatic actor is known for his role as the FBI Agent Jack Malone on the American hit series "Without a Trace" for which he has won a Golden Globe Award. The beautiful Sarah, portrayed by Julia Blake is an English born Australian actress who performs in television, theatre and films. She has appeared in Prisoner, X-Men Origins: Wolverine, The Dressmaker, House Husbands and Winners and Losers, to name a few. Her performance as Sarah in this film was outstanding. She delivered her lines eloquently and I must say this classy lady is a delight to watch. Who doesn't love John Clarke! He was born in New Zealand and now resides in Melbourne. John is a comedian, writer and a political satirist. His role as Phillip Lang who owns the Phillip Lang Real Estate is absolutely entertaining. His character is a facetious man of whom I would not get tired of watching over and over. 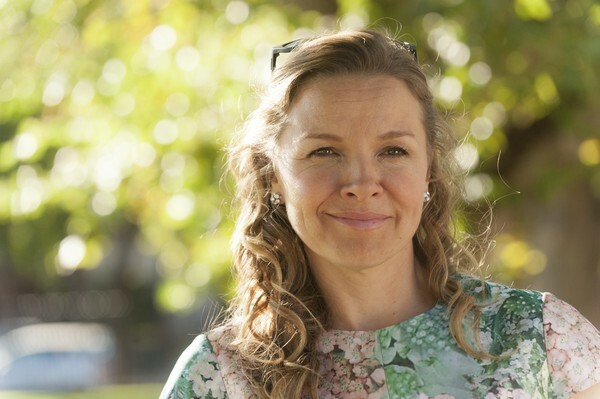 Justine Clark as Wendy, Justine Clarke is an accomplished Australian actress, a television host and also a singer. Her acting career started at a young age of seven. At the age of 12, she made her acting debut as Anna Goanna in the blockbuster "Mad Max Beyond Thunderdome". In 2006, Justine won the Best Actress Award at the Mar del Plata International Film Festival in Argentina for her role in the film "Look Both Ways". The rest of the cast is equally remarkable. So mark the 28 of April in your diary and watch and celebrate another feel-good Australian film. Appears to be a good story, not overly complicated and no doubt has an appropriate, "born again " ending, possibly including the finding by Frank Mollard of what he really should be getting out of life, more than the money and business challenges,I know how he feels ! I most certainly will be giving it a see when it hits the cinema circuits, well done little Bella !